CAPT. DON LESLIE --- "MR. SIDE SHOW"
Captain Don Leslie, known as Mr. 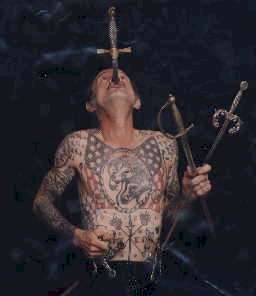 Sideshow, was a sword swallower, fire-eater, human blockhead and tattooed circus man. In addition to being a generous contributor to our museum, he is a dear friend . His display gives the public valuable insight into the history of the circus sideshow and tattooing. One wing of the museum features his personal memorabilia collection from over 42 years of circus life. Photographs, drawings and costumes cover the walls from floor to ceiling enshrining his beloved family, Tattooed Sideshow Attractions of the circus sideshow. In his lifetime, he has swallowed a staggering number of swords. In the circus sideshow, he would do 18-22 performances a day. During each performance, he would swallow fifteen times; either a bayonet, knife, sword, a saber, oil dipstick, a screwdriver, or a lit florescent tube (which one could see glowing through his chest!). During his street performance days in San Francisco, Boston and New Orleans, he sometimes swallowed a bayonet ten times an hour, fifty times a day for six days in a row...count that during a forty-two year period of time! On the misty morning of June 4th 2007 in Chico California, Captain Don Leslie peacefully slipped through the eye of the needle into the "Big Circus Sideshow in the Sky". He lived his life 'To the Hilt', and went out like a puff of smoke. Forever...he will live in our memories. Capt. Don left home at the age of 14 and joined the Ringling Bros. Circus. Working at the concession stand directly across from the Side show was inspired to join in...at the young age of 16 he billed himself as a 'fire-eater' and worked with the Cristiani Circus, and at the age of 18, he successfully got a sword down. He also swallowed neon tubes. 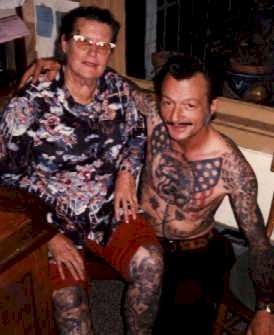 He became the 10 in one act: being the tattooed man, swordswallower, fire eater, human blockhead, human pin cushion, musician, grind man and talker etc. Hildegard's Party, Capt. Kangaroo, Mike Douglas Show, Jerry Springer Show, Discovery Channel Documentary. He was in the motion pictures "Problem Child" 1988 and in 1997 "Beloved". He is in numerous books and has been featured in countless magazines and newspapers. He was featured in The San Francisco Examiner Monday May 25,1981. He was a street performer in Boston, San Francisco's Fisherman's Wharf, New Orleans and Bourbon Street, and the Bicentennial in Boston 1976. In the "Smithsonian Photographic Historian" he is featured as "The Swordswallower of the 7th Decade of the 20th Century". (was) A Living Treasure of the Circus Sideshow.